BRACELET - SARAH COVENTRY. "MURAL" FROM 1976. 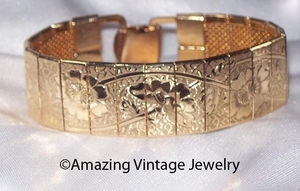 ALTHOUGH THE DESIGN IS SIMPLE, THE ETCHING ON THIS BRACELET IS A MAGNIFICENT WORK OF ART. 7 3/8" LONG, 11/16" WIDE. VERY GOOD CONDITION .